The Moscow Monorail is based on Intamin technology, with many modifications designed in by the Moscow Institute of Thermal Technology. The 4.7-kilometer system started operating in January of 2005. Heating equipment has been installed in the guideway to deal with Russia's harsh winters. 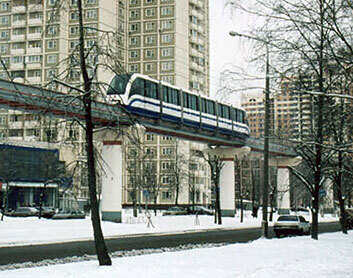 For more information and spectacular images, see the Moscow Monorail Photo Essay in our Special Features section.